The Singapore Budget 2017 was announced by Finance Minister Heng Swee Keat yesterday. And in view of the recent lamentations from the motorcycling community of the record high Certificate of Entitlement (COE) prices for motorcycles – especially affecting the smaller motorcycles – the government has announced a tiered Additional Registration Fee (ARF) tax structure on motorcycles. Under the existing tax structure, motorcycles are taxed at 27% of their Open Market Value (OMV) + $140 + current COE prices. The NEW (22 Feb 2017 onward) motorcycle tax structure introduces a tiered ARF that is dependent of the OMV amount instead of the current flat one. With the new tax structure, the theoretical price increase for motorcycles ranges from 0% for the inexpensive bikes to approximately 20% for the bigger makes, effectively becoming a tax on the bigger motorcycles and luxury makes. So, yup! Singapore’s (world’s most) expensive motorcycles just became even more expensive! Information correct as at 21 Feb 2017. The latest (Feb 17 1st bidding) Cat D COE price (motorcycles) is $6,412. Yeah… how’s your 2A coming along? TP in March right? What then should the “correct calculation” be? Share please? The calc is correct. Bikerboy is calculating the DIFFERENCE in ARF, so he has to deduct the original 15%. You’re calculating how much the NEW ARF would cost. I wasn’t interested in what the NEW ARF was. I was only interested in the DIFFERENCE between the new and the old ARF. Because this DIFFERENCE is the additional the new bike owner has to pay the government and the INCREASE in price. 1) calculate the EXISTING ARF at 15% of OMV. 2) calculate the NEW ARF using the tiered ARF table. 3) Then subtract (1) from (2) to get the price INCREASE. Let it be sharing session and I may not be correct. correct me if Im wrong. You have (wrongly) assumed that the current selling price does not include ARF – it does. 15% of OMV. See calculations below. New selling price = old selling price – old ARF + new ARF. In your calculations, you are assuming that the existing ARF is 0%??! The existing ARF is 15% flat and is included inside the existing selling price! 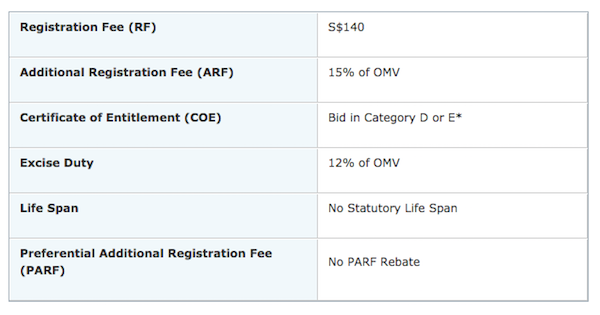 So your above “New price” should minus $1255 (existing ARF)…. = $24,480. So it seems that small bike riders are still the biggest suckers! (Still using the “old” prices) Actually, the only monies going to the government are the $140 registration fee, 27% of OMV (or 0.27 of cost of bike) and COE. The rest goes to shipping cost (which really do not care if it’s a 200kg Honda or a 200kg Ducati), distribution cost, and dealer’s profit. 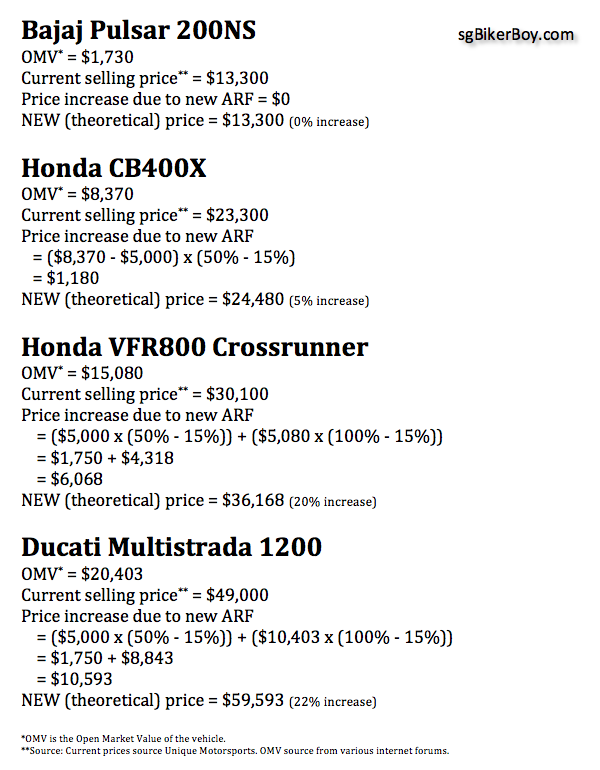 At today’s prices, COE is what is eating into the prices of smaller bikes. Why so confusing? Don’t change anything. If government wants to help working class with bikes, just change the COE system. Cheaper for class 2B, follow by 2A and lastly class 2. Those who wish to buy BIG BOYS TOY will have to pay full 6K COE while the smaller bikes pay lesser percentage of the 6K COE. Problem solved. Everyone’s happy. It’s not confusing at all. It’s merely an alignment with the existing tiered ARF system that is ALREADY in place for cars in Singapore with the motorcycles. By introducing the revised AFR, government is making the working class (smaller cc) pay even more. What help is that?!!! They still have to pay the hefty 6K COE. Don’t twist the fact by adding something new, and then make it like you are a caring government. I don’t think I quite understand you; How would this newly introduced tax structure “make(ing) the working class (smaller cc) pay even more“? U know, i have a feeling small cc bike price are gonna be affected in the long run..
My thoughts on this motorcyle arf hoohaa..
Gov see rising trend riders buying big bikes..
Gov see big bikes as luxury items, they increase big bikes arf.. Potential big bike riders grief of the fact that their dream bike has become their “keep-on-dreaming” bike.. But they still need a bike for transport and since they can still afford it, they wont think twice and still buy a smaller bike..
*So the demand is still there..
Then we read they will stop transfering deregistered motorcycle quotas to open category.. rejoice?? Nope.. Unless gov increase back motorcyle quotas, referring to the * above, those group will indirectly buy out the quotas.. so end up price coe will increase..
Then the small bike riders will grief too..
Then what abt the bike shops selling both big and small bikes.. big bikes not making money, so mark up small bike prices to cover lor..
No win situation for riders in sg now..
Well i could be wrong.. Except maybe for the gov themselves..
It’s always willing-buyer-willing-seller. I’m pretty sure if you have an almost new (BIG, expensive) machine, you could probably sell it for about the same price as when you purchased it. But for an older bike, the effect is likely a lot less. In fact, owners may even not be willing to sell now because it cost them more to buy a new one! And on the other hand, your machine may now appear more attractive (easier to sell) because those who were previously looking for a new machine may now want a pre-owned one. Theoretically the “on-the-road” price for small bikes (OMV < $5,000) should drop with the expected moderation in Cat D COE prices. We shall see in the coming months whether ceasing the contribution of Cat D COEs into Cat E has that effect. The revenue lost from selling Cat E COEs has to be recouped somehow – tiered ARF is the answer to that. It does appear that local motorcycle businesses were not consulted prior to the announcement; for that matter, probably no one, not even the media (who were busy interviewing car dealerships prior to Budget 2017) saw this coming! 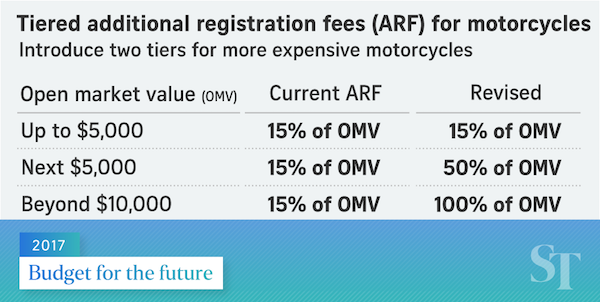 Setting the ARF band at $5,000 seems a little low though, given that about half of motorcycle registrations would be hit with higher taxes. As such, calling the tiered ARF a Luxury Tax" isn't particularly appropriate when even a Super4 is affected. A Super4 is a good bike, but practically nobody would call it an exotic or "luxury" bike. Well, the tiered ARF structure seem to have been calibrated to aid the “small bikes” in the exact manner you’ve pointed out – theoretical reduction of COE prices due to, 1) subdued demand from the bigger bikes and 2) the cessation of reduced supply from the contribution to CatE. Note that there still is a “middle tier” – that $5,000 to $10,000 OMV attracting a 35% increase in ARF (50% – 15%). Should COE prices fall by more than $1,750, this group “wouldn’t be affected” by this ARF increase when compard to today’s scenario. So, effectively, the scheme was designed to help the small bikes, leave the middle bikes relatively unscathed, and tax the big bikes. Previous Previous post: When was your last motorcycle cable maintenance?